We had an excellent late night dinner at Bobby Flay's restaurant, Bar Americain Mohegan Sun, located in Uncasville, Connecticut after attending a Stevie Nicks' concert at the Mohegan Sun Arena, and found the food, the ambience, and the service to be the perfect finale to a wonderful evening. The attractive 276-seat Bar Americain Mohegan Sun opened in November 2009, where Bobby Flay's focus is to "celebrate the vast culinary traditions found in the US while also featuring dishes that showcase the wealth of ingredients and traditions of New England and, given our location, that of the Native American culture." The contemporary ambience features a curved wall of windows graced with window treatments, a generous zinc-topped bar, and an ample Raw Bar. White linen dressed tables are flanked by stylish tobacco leather and wood back chairs, the restaurant is illuminated by recessed lighting in the wood paneled and hand painted ceiling, as well as by attractive wall sconces, and low music sets the mood. Ready to unwind after an exhilarating Stevie Nicks concert on July 12, 2012 Edward began by ordering a glass of La Follette North Coast Pinot Noir 2010 from California, which was a delicious combination of red fruit and earthiness. I selected a glass of Omaka Springs Estate Marlborough Sauvignon Blanc 2011, from New Zealand with tropical fruit and herbaceous notes, to pair with our order of Hot Potato Chips with Blue Cheese Sauce. 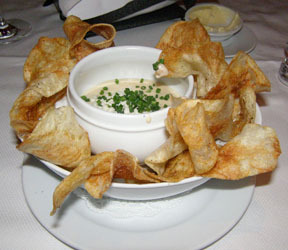 Talk about playful decadence, the hand cut thinly sliced potato chips were served hot from the deep fryer accompanied by a generous bowl of melted blue cheese, which were a delicious adult treat. From the Raw Bar, Edward had the Shellfish Cocktails: Tasting of All Three, which consisted of Shrimp-Tomatillo, Crab-Coconut, and Lobster-Avocado, each of which he graciously allowed me to sample. When asked which cocktail was his favorite, Edward replied, "all of them." 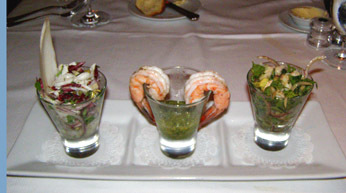 The shrimp cocktail consisted of two jumbo shrimp served with a spicy and delicious tomatillo sauce, the crab and coconut with small, diced pineapple was also delectable, and the lobster and avocado was another winner. 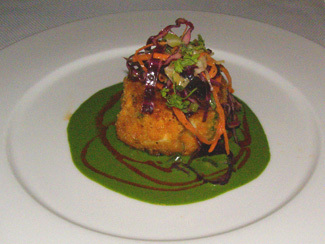 From the Appetizer section of the menu, I had the Red Pepper Crab Cake, with cabbage slaw, and basil vinaigrette, which arrived as a large, round ball of crabmeat lightly seared to create a golden crown, topped with the slaw, with a generous pool of perfectly spiced basil vinaigrette. Creating interesting spice combinations is one Bobby Flay's signatures, and this was a perfect example of highlighting flavors. The crab was flavorful and perfect. When our server brought a tempting basket of hot rolls and corn bread to our table accompanied by flavored butter, we could not resist and enjoyed sampling them as well. 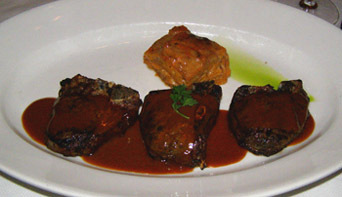 For his entrée, Edward had the Porterhouse Lamb Chops with Mustard Barbecue Sauce, and Sweet Potato Gratin. This dish was gorgeous, with the lamb chops singing with the zing of the mustard barbecue sauce, paired with the sweet potato gratin redolent with cinnamon. 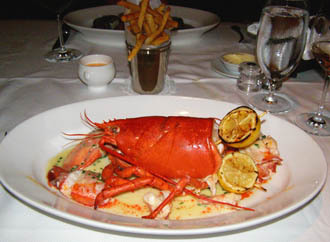 I had the Steamed Lobster, with Roasted Lemon Butter, and Fries Americain served with Smoked Red Pepper Mayonnaise, a dish for which the restaurant is famous. This was pure New England at its very best, a robust and succulent steamed lobster removed from its shell and served with grilled lemon halves and lemon butter. Lobster and fries were made for each other, however when served with the spicy smoked red pepper mayonnaise they were transformed from ordinary to extraordinary. Although the dessert menu looked enticing, given the lateness of our dinner, we opted to resist, which provides us with something to enjoy on our next visit. 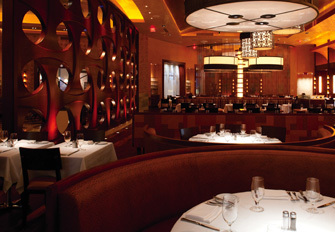 Bar Americain Mohegan Sun serves dinner from Sunday through Thursday from 5:00 pm until 10:00 pm, on Friday and Saturday from 5:00 pm until 11:00 pm. The Bar and Lounge is open Sunday through Friday from 5:00 pm, and on Saturday from 3:00 pm until 11:30 pm. Follow Mohegan Sun on Facebook at www.Facebook.com/MoheganSun and Luxury Experience on Facebook at www.Facebook.com/LuxuryExperience.